Polgar: "Obviously we would like to get a medal"
We spoke to the world's strongest ever female chess player, the legendary Judit Polgar. She has played in nine Olympiads since her debut on the Hungarian women's team in 1988 at the age of 12. Since 1994 she has played for Hungary in the open section, on a team that is always a serious contender for medals. Judit plays on 4th board in Tromsø and has gotten off to a good start, winning her first two games. Tarjei J. Svensen: Judit, you’ve played in many Olympiads – what are your impressions of this event compared to previous ones? 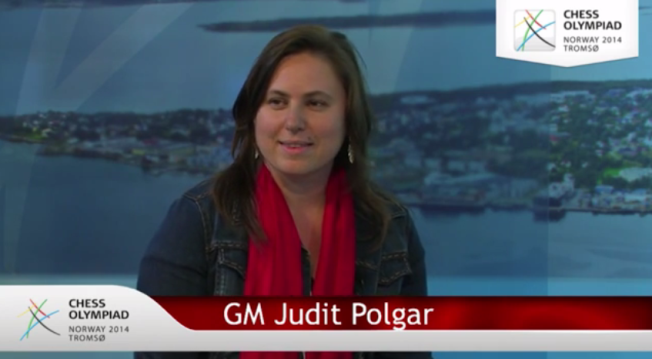 Judit Polgar: Well, many things are well organised. I like the playing hall, and it's impressive that in Tromsø I see all kinds of logos and posters and everything, which is very nice. The food that we get is really good, especially the salmon, which I appreciate. My hotel is good and the view is beautiful, so I’m happy. There is a slight problem with the toilets here, which are a little bit below the level that we're used to. What do you do in-between rounds – do you have any visits planned? Well, on the free day we might be going somewhere, but so far it's just the tournament and preparation to get warmed up. And what are the expectations of the Hungarian team in this event? Well, obviously we would like to get a medal. That's why we're here - and we are number five on the list by rating. But there are so many great teams and everybody came to take a medal. In general, we don't think about it so much. We have to play well and be successful, which is not the same sometimes (laughs). In general you have to be around the top 10 up to round 8 or 9 and then if you win your last two or three matches, you're there. You have to be near the top guys. Who do you consider the favourites to win? Obviously Russia are the highest rated and they are the best, clearly, but somehow in recent years they were not able to show it on the board. Well, there are many reasons. It can be that the players are tired, or they are not well-knit as a team – too many individuals and characters. There is a lot of pressure, probably, and the officials are expecting them to take gold medals home. So there are a lot of factors, but it's clear that some things didn't go well in previous Olympiads. And some of the other teams are extremely focused and hungrier to get all these medals. What do you think about the media coverage of chess in Norway? I think those things are really amazing and it's fantastic that when Norway got the opportunity to organise the Olympiad Magnus was still a long way from being number 1. So this is actually also luck for the organisation and I think it's fantastic if they can profit from a national TV channel covering it this way, because chess is up against many other well-known sports. I think chess can be very interesting if you have very good people reporting and covering it. So this is really very impressive and this is their first Olympiad and the organisation must be very proud of that. And also the website is very nicely done. It's very nice that it's in three languages, and all the commentary. So it's very seriously thought over how it should be organised.